Since Jan Brady famously once said “Marcia, Marcia, Marcia” in episode 10 of season 3 of The Brady Bunch, because her big sister was getting all the attention, I’ll simply say, “content, content, content” about marketing attention in 2013. 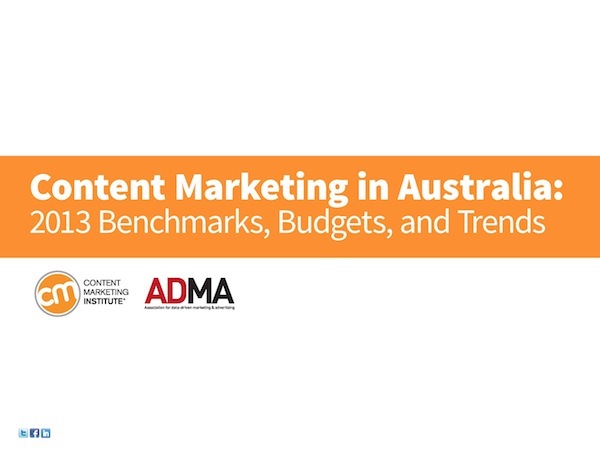 There are a bunch of insights in the first ever study into Content Marketing in Australia by the CMI and ADMA. It’s a must read for marketers and agencies. 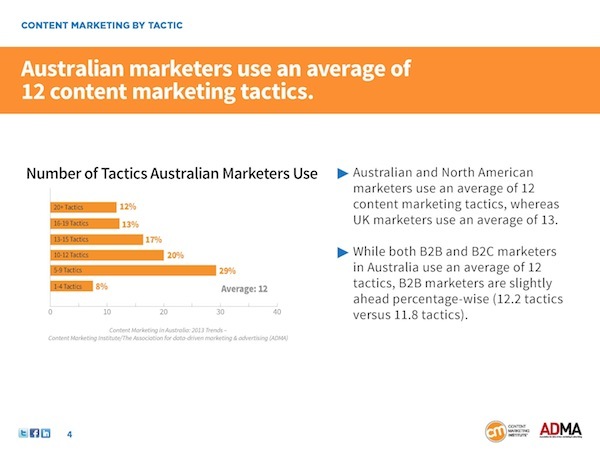 Australian marketers use an average of 12 Content Marketing tactics. This seems to correlate closely to Google’s Zero Moments Of Truth (ZMOT) analysis where consumers on average research 10.4 pieces of online content before making a purchase (note, this has increased 2-fold from 5.27 in 2010). Only 29% believe their content marketing is “very effective” or “effective.” It always amazes me how many marketers are going through the motions, doing things the way they’ve always done them. I can’t believe so many marketers are settling for mediocrity. 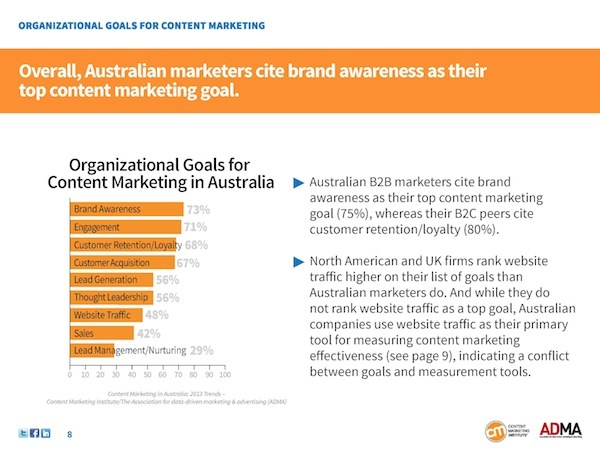 The top 3 content marketing goals are: Brand Awareness (73%), Engagement (71%) & Customer Retention / Loyalty (68%). That’s obviously a massive spread across the marketing spectrum. My view is that content marketing should be used for brand engagement. I’d be interested to know what you’re using it for. 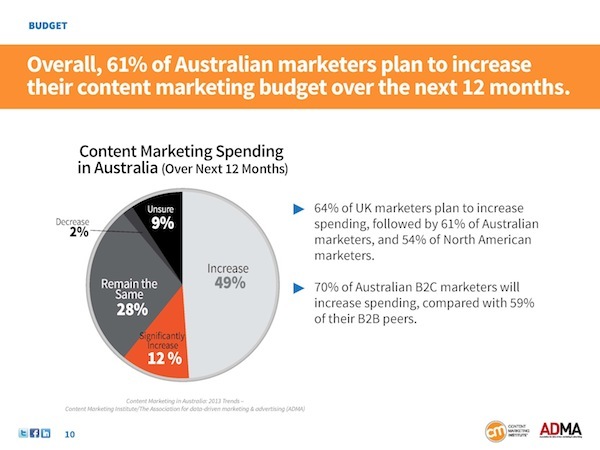 61% of Australian marketers plan to increase their content marketing budget over the next 12 months. This raises an interesting question of whether it should be produced in-house or outsourced to specialists? 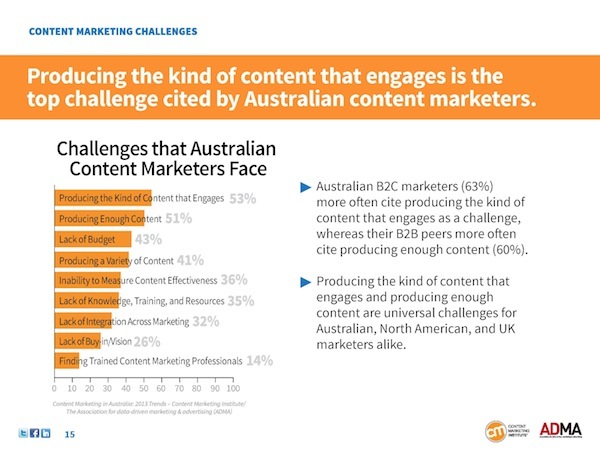 The top challenge for content marketers is producing the kind of content that engages, closely followed by producing enough content. Interestingly I was at a client today that was drowning in fantastic content however they didn’t have a structured approach to market it to their customer base. 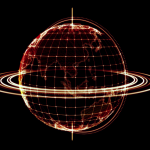 If you’re looking to transform your digital activity in 2013 then you’ll need to achieve the right balance between content production and content that truly engages. One area the report fails to delve into is whether marketers are commercialising content, however there are plenty of other thought provokers. And let us know what you think? 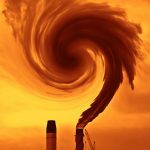 Is your content marketing strategy working for you? And if not, what areas are the most challenging?